Here’s specs comparison between Apple’s 2016 MacBook Pro with Touch Bar Vs Microsoft’s Surface Book 2 i7. Like any other comparative hardware, these two different machines have their advantages and disadvantages, but how do they compare when you put them together and compare specs-wise? If we start with Microsoft’s second-generation Surface Book dubbed the Surface Book i7, then you are faced with a laptop that weighs approximately 3.5 pounds, has a varying size depending on whether or not it is attached or detached from its base, and ships running Microsoft’s own Windows 10 Pro. The machine ships with a stunning 13.5-inch PixelSense touch-screen display, complete with 10-point touch and a 3000-by-2000 pixel resolution at 267 pixels per inch. Performance wise, the Surface Pro is powered by a sixth-generation Intel Core i5 or i7 depending on the specification chosen, and can be accompanied by 8 or 16GB of RAM. When considering Apple’s 2016 MacBook Pro, which was announced during today’s “hello again” event, you get either a 13 or 15-inch model that measures in at just 13.9mm thick and weights just 3 or 4 pounds depending on the screen size chosen. That MacBook, of course, comes pre-installed with Apple’s macOS Sierra, and is powered by the Intel’s sixth-generation quad-core Core i5 or i7, which once again is based on the variant and specification chosen. The MacBook Pro also features Apple’s brand new Touch Bar multi-touch Retina display above the main keyboard, complete with integrated Touch ID sensor and Secure Enclave embedded within the power button. However, the 13-inch entry-level model does not pack these new goodies. Ports wise, Microsoft’s Surface Book i7 offers two USB 3.0 ports with a full-size SD card reader. There’s also a Surface Connect, headset jack and mini DisplayPort. Apple on the other hand has gone down the route of integrating four individual Thunderbolt 3 ports with USB-C connector that can be used for power, Thunderbolt, USB, DisplayPort, HDMI or VGA. On the 13-inch base model however, you only get 2 of these Thunderbolt 3 ports, but with a similar set of functions. Apple’s MacBook Pro with the Touch Bar and Touch ID is available starting from $1,799 for the 13-inch model and goes up to $2,599 for the 16GB RAM and 1TB SSD model, or $2,399 for the 15-inch model which goes up to $4,299 for the 16GB RAM, 2TB SSD, and Radeon Pro 460 with 4GB memory. Though the 2016 model without Touch Bar and Touch ID starts from $1499. All models are available in two finishes, Space Gray and Silver. Microsoft’s 13.5-inch Surface Book i7 on the other hand starts from $1,349 and goes up to $3,199 for the top-end model. So, which one would you rather pick? Sound off in the comments below. What a terrible comparison. Very few direct features compared. Very biased wording as well. Such a shame as I was looking forward to reading something objective. You are very biased towards Apple. 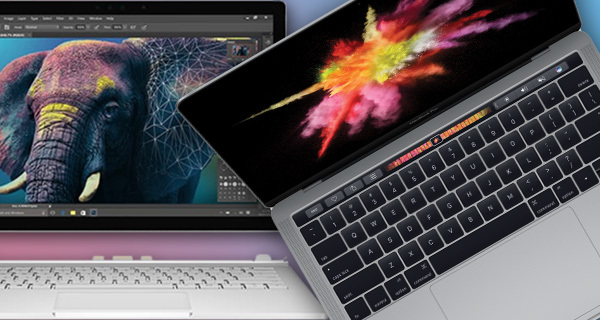 Surface Book 2 i7 model comes with Kabylake, the newest form of i7, whilst Macbook Pros come with Skylake, the last gen of processors. The 13.5 inch Surface Book also comes stacked with aNvidia 960m dGPU, and a much superior battery life thanks to batteries on both partitions of the device. The Macbook Pro comes with AMD dGPU on even the top level Pros for some stupid reason, and provide nothing new but the very inefficient touchbar which means you need to look at your keyboard to adjust simple things that used to be done by just feeling the keys. And only adds shortcuts which could be done by shortcuts on keyboards. It’s the biggest gimmick of a computer, and it would be fine, but they put the price up!!! WTF?!? What warrants a price hike from what Apple announced compared to Surface Book?? Apple have completely lost it, and have lost a lot of customers to the Surface Book and Surface Studio last night, including me. You even used the spec sheet for the Surface Book 1. Do your research. Kaby Lake is 7th gen of Intel. is that directed towards me or…? I laugh while reading this.. Lol. Thx to make my day! Can’t say I’m too surprised, but honestly, couldn’t we get some real writers for this site? I agree with you – something I’ve noticed with RedmondPie, and the reason why I’ve stopped both recommending it as a tech blog or visiting it as often as I once did. I Love iOS & Apple. I equally Love other tech brands i.e Microsoft, Samsung etc. I only appeared here as it was on my Google Now feed and was intrigued if I had missed something from the Apple Keynote. But yeah, I won’t be returning to this site if they can’t even get some facts right about a comparison haha. I am in the same boat, no reason to hate any company, they all just want your money. But Apple have no reason for me to spend that much money on a really small bump in specs from last year’s models. But they hike the price up anyway. And in comparison to the Surface Book, it just looks so old and boring already for a device that got its first update in 4 (?) years. “Apple’s MacBook Pro with the Touch Bar and Touch ID is available starting from $1,799 for the 13-inch model and goes up to $2,599 for the 16GB RAM and 1TB SSD model, or $2,399 for the 15-inch model which goes up to $4,299 for the 16GB RAM, 2TB SSD, and Radeon Pro 460 with 4GB memory. Though the 2016 model without Touch Bar and Touch ID starts from $1499. All models are available in two finishes, Space Gray and Silver. Sam, here’s why you’re an idiot. there is no quad core Kirby lake, and apple wanted the better multi threaded performance. They start being sold in Dec, if projections from months ago are right. You’re quite a bit more biased than they are. You’re comparing different voltage, and core cost processors as if they are the same speeds. You’re intentionally mis leading. the 460 pro is actually better in most ways (and benches) too. Sorry, but you’re full of it. Surface Book i7 has Intel 6th gen Skylake Core i7 processor ! Yes I know this, and I am a lil bit yeah, but mainly because the writer got the Surface side so wrong and is clearly very biased. I just wanted to make sure Surface got it’s cred. And I also don’t believe the Macbook Pro is worthy of that £400 increase for a processor they should have been using for a year already, among other reasons. The SB i7 dual core is still an absolute machine though, and my main comparison is between 13″ and SB, as the 15″ rMBP is known to be able to carry higher performance due to the space in the base, better cooling etc. But, still, the cost to what the user is actually getting, it’s ridiculous, no? I just feel like the Pro is no longer a Pro, it’s just a ridiculously expensive laptop with not even the highest internal specifications, not even for configurations. No it has 7th gen Kaby Lake, Skylake is 6th Gen.
You are wrong. Look up for specifications. There are no quad-core Kaby Lake processors yet. The Surface Book can’ t drive 4 4k monitors. It barely support 1 at 60Hz. You’re just as biased, just in the opposite direction. You think lower TDP chips can hang with higher ones? the price IS VERY HIGH, but it’s a pretty sick machine. In reality, it’s like most apple products, and you’re just a fanboy, who doesn’t know his tech. Learn from this. I am aware, but I am going from 13″ MBP vs i7 Surface Book. Both rock dual core i7, and I believe at almost identical power. Difference being, one has a dGPU, 965M, whilst the other does not have one, I’m not sure if it can be configured in but I doubt it, but please correct me if I’m wrong. And yes, TB3 is cool, and the screen is apparently quite beautiful, but that is the only feature set within the extremely expensive computer which is worth the cost. Everything else is just not the best they could supply, which is ridiculous for the cost, and for a pro line. The 15 inch MBP I understand is powerful, running a full size quad core i7 Skylake CPU at high power, but it still lacks a dGPU worthy of the cost which would increase productivity times for creative folks. And that really bothers me for the price tag. I’m no fanboy of either side, I have an SB now, and I hate the fact that Adobe does not make their program work as smoothly as it did with my 15″ 2013 rMBP. But the rest of the machine is killer for the cost, especially the touch screen and pen for when I’m designing, and the keyboard feels amazing for my long stints when coding, something I’m really upset about as I have a Macbook for iOS developing and the butterfly clips are annoying for long typing period imo. I miss my MBP when I am using Adobe products, I love my Surface Book for the power in it’s form factor and the screen. Seriously I love having a dGPU in this tiny package, I can only imagine what the new one with the upped dGPU will be like. But everything else, I’m mutual. But Apple have lost it when they priced such a ‘mediocre’ laptop at such a ridiculous price, and also, pure USB C? That is just silly for a pro machine in this time. In two/three years, sure, but not only do printers, graphic tablets and all the peripherals not adapted to USB C yet, but not even their own 2016 products are using USB C! Adapters galore to use anything on a £1500+ machine. Ridiculous. Anyone who claims this is okay practice for such expensive products are sucking Apple way too hard. No, they don’t have identical power. You “believe” don’t “believe” LOOK IT UP. LEARN WHAT TDP IS. Learn the different lines of i7’s, their voltages, and core counts, and what that does to their benchmark scores, *before* talking about power. The dgpu actually bench’s great from what’ i’ve read from real websites (tom’s, / anand / ars) And compares well (within 5-10%) of nvid mobile GPUs, but dies when put up against full desktop 1080s from like, the blade pro line. The blade pro is also 8lbs, comparing it and not mentioning that, is ridiculous. You again, don’t know enough about what you’re talking about to comment. But you’ll keep doing it. these people like @SamDH1:disqus and @frodbonzi:disqus are only here for their own purchase justification reasons. IT’s beyond pathetic to those who just wanna talk about tech. Your all missing one huge but important point, no matter if the Surface is superior to the Mac, albeit by possible milliseconds in day to day life it still runs Windows, the end. Thats the biggest pile of BS I’ve read for a while, thanks…. That’s really shallow. Youre no different to those nostalgic people who still swear by windows XP. It’s almost 2017, times have changed.